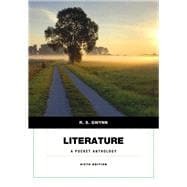 Literature A Pocket Anthology is a refreshing alternative to voluminous literature anthologies. with streamlined apparatus, this anthology focuses on the selections which are organized chronologically within each genre. Short story authors new to this collection include award winners Amy Tan Rick Moody, and Johnathan Safran Foer. The poetry collection brings new selections from classic and contemporary authors, including Anne Bradstreet, John Keats, e.e. cummings, and Langston Hughes, as well as fresh models from poets new to this edition including Denise Duhamel, Kevin Prufer, Rob Griffith, and Caki Wilkinson whose work brings poetry into the 21st century. The drama section includes the most popular teachable plays including Shakespeare's Othello, Hernik Ibsen, A Doll House, and August Wilson's Fences. R. S. Gwynn has edited several other books, including Drama: A Pocket Anthology; Poetry: A Pocket Anthology; Fiction : A Pocket Anthology; The Art of the Short Story (with Dana Gioia); and Contemporary American Poetry: A Pocket Anthology (with April Lindner). He has also authored five collections of poetry, including No Word of Farewell: Selected Poems, 1970-2000. He has been awarded the Michael Braude Award for verse from the American Academy of Arts and Letters. Gwynn is University Professor of English and Poet-in-Residence at Lamar University in Beaumont, Texas. What’s That Smell in the Kitchen? Winter Retreat: Homage to Martin Luther King, Jr.